Before the whistle blows and his team congregates, Harley Yutzie can be found stretching on his own, participating in some friendly banter while some of his teammates throw a football around. “You better watch out today. I’m going to be all over that inside gap. I'm getting past, you know. Hope you're ready,” Yutzie said. 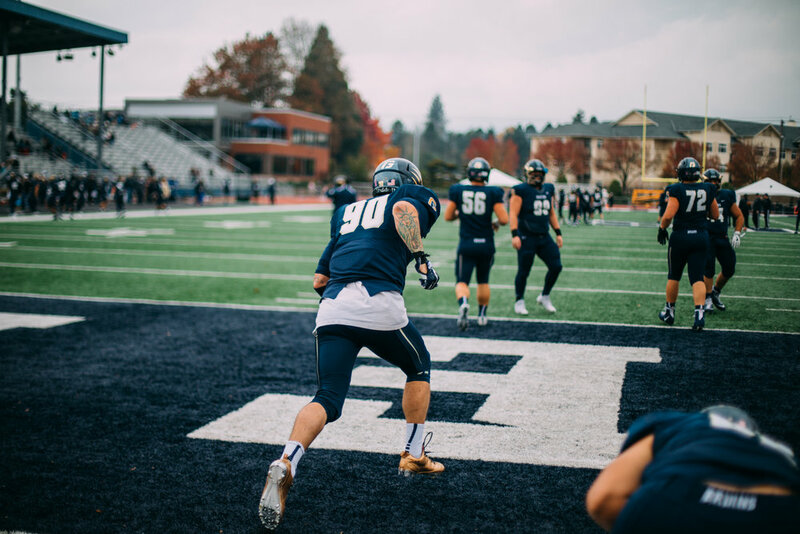 Yutzie, a senior from Sublimity, Ore., plays defensive end for the George Fox University (GFU) Bruins football team. Prior to starting his football career at GFU, Yutzie attended The College of the Siskiyous in Weed, Calif. The community college is where Yutzie first began his collegiate career while earning his associate’s degree. He then made the jump to GFU where his plan was to finish out his remaining two years of eligibility. But, during his freshman year at Siskiyous, Yutzie encountered devastating and unexpected health problems during what was supposed to be a routine practice. It turned out rest would be hard to come by. “Later that night I collapsed and started to go into some sort of shock. I was rushed to the E.R. where I found out that I had a blood clot that released in my brain. A stroke. The whole left side of my body was paralyzed,” Yutzie said. In and out of consciousness, Yutzie's ability to assess what he was enduring was absent. Hours after being admitted to the hospital, Yutzie was able to stay awake. The doctors gave Yutzie the news that he was not ready for: He would never play football again, nor would he be able to go to college due to the cognitively challenges. If he ever walked again, it would take six to eight years. After two years of training and physical therapy, Yutzie made a full recovery and was cleared to play football. When asking Yutzie about what the hardest thing about his recovery was, he looked down and then up with a really deep sadness. “A stroke hurts a lot. The constant aching of my body, but the hardest thing is looking at your parents at the end of your bed and knowing they would give you the world to help you but they can’t do anything about it,” Yutzie said. “When it’s affecting other people around me not just myself, that’s a hard thing to face,” he added. After making a full recovery and being cleared by his medical specialist, Yutzie decided to go back and play at The College of Siskiyous for the 2015 season. With open arms coaches and players welcomed Yutzie back home. Yutzie had suffered a major stroke and the coaches noticed that he was still on the slimmer side. Before they would let him step on the field for live practice, they wanted him to gain to his pre-injury weight. Back to training Yutzie went. Yutzie managed to gain weight and made it to 15 pounds shy of his freshman weight. Physically cleared and excited, Yutzie was about to play the game he loved once again, but once on the field things started to change. During the offseason in 2015 Yutzie received news that would again change the course of his football career. “I received a call from Coach Bates and that is how I found out about Fox. I was on my way to a bigger school to show that I am still able to be a part of this game,” he said. Yutzie is in training non-stop these days, as his goal is to make it into the starting rotation for the Bruins. “All I want to do is play football and make the most out of this situation as I can,” he said. Off the field, Yutzie has been interviewed the last few years by Portland filmmakers who are showing Yutzie’s long road back to the game. “I want to tell people my story. I want to show that you can overcome anything when you have the mindset,” Yutzie said.